Poggi is a small Ligurian town that lies just above Imperia. 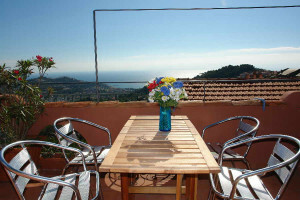 From nearly every point in Poggi you will find yourself staring at the wonderful vista of the sea and Imperia. The small mountain village lies somehow above Imperia. The view of the coast is breathtaking. Idyllic hiking trails offer the perfect balance in natural scenery. The Prino valley, below Poggi, similarly offers many opportunities for excursions. Many hiking trails and mountain bike tracks go through the hinterland of Imperia and the Prino valley. If you want to experience the coast and the sea, you can be at the beach within a few minutes by car. Poggi is part of the Imperia municipality. The village was already inhabited in early Middle Ages and was integrated into the municipality of Imperia from early on. 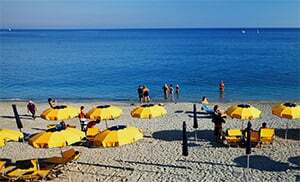 Poggi belongs to the municipality of Imperia and is a village in the Imperia province which lies in the Liguria region. In the vicinity of Poggi are several other villages like: Civezza (3.3 km), Torrazza (3.5 km) and Caramagna Ligure (8 km). From Genoa, take the Imperia Ovest exit and follow the Via Tommaso Littardi up to Poggi.